Abstract Fiber is headed to SOAR! Spin-Off’s Autumn Retreat is the last week of October in southern Wisconsin, just outside of Chicago. 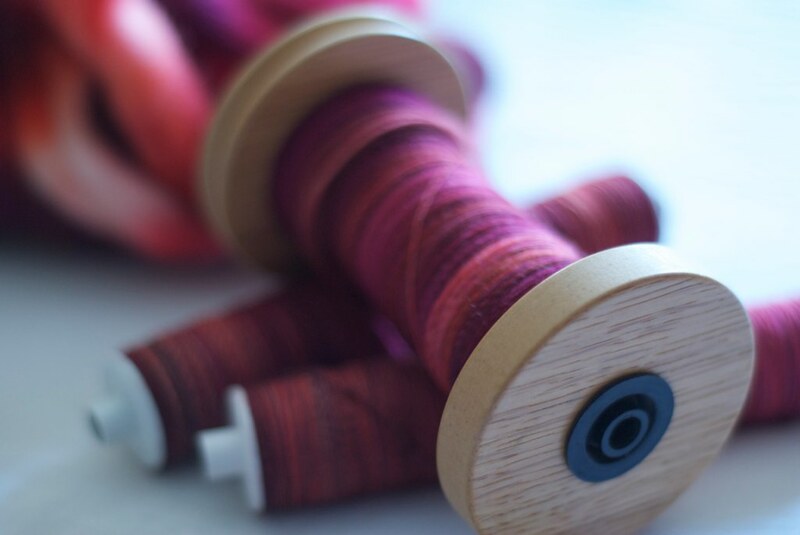 We’re bringing crimpy, easy to spin cashmere, Polwarth, and BFL/Silk as our featured fibers, plus Hedonism, our luxury yarn available only direct from us. We’ll have our regular yarns and fibers too. If you can’t make it to SOAR check out AbstractFiber.com to find a local retailer or shop online. The market will be open to the public on Thursday, October 28, 10:00 am to 5:00 pm, Friday, October 29, 4:00 pm to 9:00 pm, Saturday, October 30, 10:00 am to 5:00 pm. Everything's coming up Cassidy at Purlescence Yarns! Join us for our fabulous fall Cassidy Knit-Along, featuring Chic Knit's wonderful cabled cardigan pattern. We're loving this piece knit in Manos Rittenhouse Merino 5-Ply, Cascade Venezia & Eco Wool, Lorna's Laces Green Line Worsted & Shepherd Worsted, to name but a few. Mention the Knitmore Girls when you place your order for 10% off your yarn purchase for the KAL through the end of October. And don't forget, Amy Singer is coming November 2 to teach her Non-Wool Socks Class. Seats in this class are limited, so sign up early! - The Spin Control Podcast feed has changed! The RSS feed is: http://www.itunes.com/podcast?id=398083952 and you can find our tutorial on updating Podcast feeds in iTunes here. - The Knit Sibs Podcast is back! Jasmin is a little forlorn about missing Rhinebeck this year. Jasmin loves Rachel's (of the Knit Cents Podcast) sweater forecast. Gigi gives a short synopsis of the Pacific International Quilt Festival. We talk about our incredibly wild and wooly weekend. Jasmin is working on Meghan's Sweater Swap 2010 Twist Cardigan. Gigi dug out some old projects for Finishing Friday; she wove in all the ends on her Katarina cardigan. Jasmin had a knitting crisis, and couldn't find the skein of Abstract Fiber Temptation (in Snapdragon) or the socks she had started for Andrew out of the Creatively Dyed J'ouvert in "Cake". Gigi has worked on her Aeolian shawl. Jasmin is still working on her Supernatural socks, and was tempted by the new Supernatural colorways from Damselfly Yarns. Gigi has dusted off her sewing machine! Join our Knit-A-Long! Gigi is knitting the Cassidy cardigan out of Manos Rittenhouse, and Jasmin is knitting the Cece Cardigan. You can find the Cassidy KAL thread here, and the Cece KAL thread here. We talk about converting sweater patterns from 5 separate pieces to three-piece sweaters (Body and two sleeves). Meghan's Twist Cardigan is attacked by the Dark Chocolate episode of the Knit Wits podcast. Gigi suggested just fixing the cable, and Jasmin describes how she fixed it. Gigi knows best, duh. Jasmin has finished plying the "Oh Pretty Woman" Superwash merino from Crown Mountain Farms. She talks about how different drafting technique yields different color display, and the Vineyard superwash merino from Abstract Fiber.